Welcome to this month’s edition of “Liturgy Notes”, the liturgy and music section of the Faith & Life e-newsletter. A significant focus for the year is the preparations for "Lift Up Your Hearts", a National Liturgy Conference to be hosted in Wollongong next January 2014. This month’s article on upcoming Music Selections for Mass includes recommendations for April, May and the first week of June 2013. 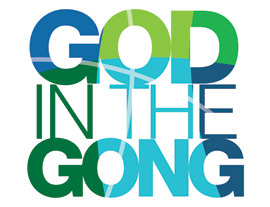 Come along next Tuesday (9 April) to God in the Gong - an evening of live music, catechesis and discussion, with Mr Peter Turner (Director of Schools, Catholic Education Office Wollongong) talking about "Faith and the Future: Can we learn to be Catholic?" TOPIC: Faith and the Future: Can we learn to be Catholic? Come down for dinner beforehand, grab a drink, meet old and new friends, enjoy live music and prepare for a night of great conversation as we celebrate the Year of Faith. 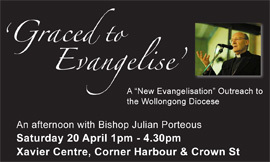 Graced to Evangelise - An afternoon with Bishop Julian Porteous in Wollongong on Saturday 20 April 1pm - 4.30pm Xavier Centre, Corner Harbour & Crown St Wollongong (next to the Cathedral). 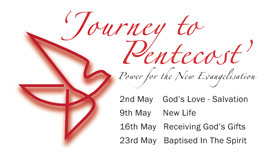 A “New Evangelisation” Outreach to the Wollongong Diocese. Bishop Julian will provide an understanding of the vital active role that all the people of God are called to have in the church. What is this New Evangelisation? Does it affect me as a Christian? 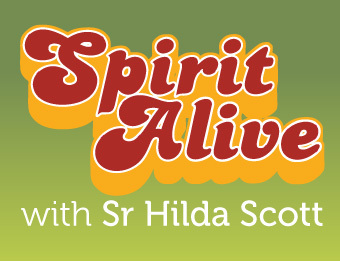 Sr Hilda Scott! Whenever Sr Hilda speaks to young people they walk away affirmed, challenged and inspired. Sr Hilda is a nun from the enclosed Benedictine Abbey at Jamberoo. She became known to wider Australia through the ABC TV documentary, The Abbey, in which five Australian women were invited to live a monastic life for 33 days and nights. Sr Hilda engages in spiritual direction, retreat giving, talks and formation work with the newer members of the community, not to mention the “nitty gritty” everyday happenings of kitchen, garden and housekeeping, all within a life of prayer for the world. In addition to Sr Hilda Scott, the evening will include a Youth Mass, dinner (bring some money for dinner) and an evening of praise and worship. The World Congress of Families is a time of teaching, learning, networking and exchange as those who seek to strengthen and promote the natural family tackle some of the most complex issues affecting family life today. WCF7 Sydney 2013 will bring together many of the world’s leading pro-family advocates, policy makers and academics, business leaders and professionals, educators and students, media and popular culture figures and many parents - the backbone of a healthy society. It seeks to inspire people from all walks of life to consider and implement strategies to help strengthen the natural family, the economy and civil society. See www.wcfsydney2013.org.au or call (02) 8251 0045. To commemorate the 50th Anniversary of the commencement of the Second Vatican Council, a national conference will be held in Sydney. 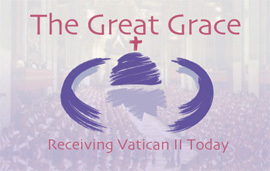 "The Great Grace" will be a wonderful opportunity for Catholics involved in all fields of Church life to come together and gain a renewed appreciation of the ‘great gift’ of Vatican II. Featuring international speakers Cardinal Marc Ouellet, Archbishop Allen Vigneron, Archbishop Arthur Roche and more. Local presenters include Cardinal George Pell, Archbishop Mark Coleridge, Professor Anne Hunt, Professor Anthony Kelly and Professor Tracey Rowland. Lay people, clergy and religious all welcome. Register now at www.thegreatgrace.org.au. For more information download the below brochure or call (02) 9281 0284. Saturday 1 June, 10-3:30pm, Xavier Centre Conference Rooms, 38 Harbour St Wollongong. 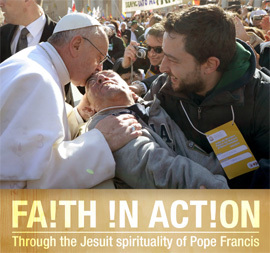 Join renowned national speaker Sandie Cornish as she helps us unpack Catholic Social Teaching through the Jesuit spirituality of Pope Francis. Learn the basic tools to move from faith into action in your everyday life. Through prayer, reflection, sharing and input we will identify issues facing us today, discover the riches of Scripture and Church Social Teaching and explore ways of beginning to develop our understanding and response to these issues. There are only 90 places available so RSVP is essential to darren.mcdowell@dow.org.au or phone Darren on 4222 2463. The cost of the day is $10 and morning tea and lunch will be provided. 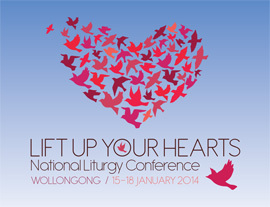 “Lift Up Your Hearts” National Liturgy Cnference (Wollongong, NSW, Wednesday 15 - Saturday 18 January 2014) - SAVE THE DATE! Hosted by the Catholic Diocese of Wollongong and sponsored by the Australian Pastoral Musicians Network (APMN), this conference will explore and celebrate Vatican II’s vision for “full, conscious and active participation” (SC 14), living the mission in prayer and worship. 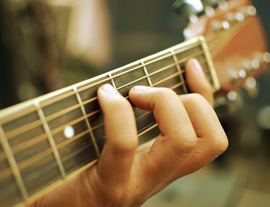 Participants will be able to choose from many learning opportunities, uplifting experiences of liturgy and music, along with showcases, exhibits and all that Wollongong has to offer in summertime! The week will provide a wonderful opportunity to mark the 50th anniversary of Vatican II’s Constitution on the Liturgy Sacrosanctum Concilium and the inaugural Australian Pastoral Musicians Network (APMN) Convention. Details of the full program and speakers will be announced toward the middle of the year. For more information in the meantime, contact Paul Mason, Coordinator of Liturgy, Diocese of Wollongong, phone 02 4222 2462 or email paul.mason@dow.org.au. Our Faith & Life eNewsletter has been progressing well over the last 10 months but we are always keen to get your feedback in order to make improvements. 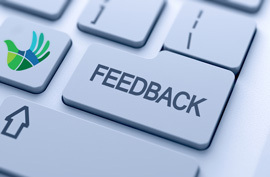 So, with 2013 not too far away I invite you to participate in our short online survey. It only takes two minutes to complete.